For the first time in its history, Solaris Bus & Coach has won a contract for the supply of Saint-Etienne Trollino trolleybuses in France. In accordance with the terms of the tender, it will deliver 22 to Saint-Etienne between 2019 and 2022. The value of the contract is said to be over €17m. The 12m Saint-Etienne vehicles will be equipped with a Skoda drive system and batteries with a capacity of over 40kWh, which will allow them to drive outside the traction network. The specification will include air-conditioning, the so-called ‘anti-aggressive drivers’ cabin and an innovative interior lighting system that will be partially mounted in the passenger handrails. Five of the trolleybuses will be delivered by the end of 2019, five more in 2020 and the remainder in 2021-2022. The contract includes an option for a further two vehicles. Solaris made its debut in France during 2003. 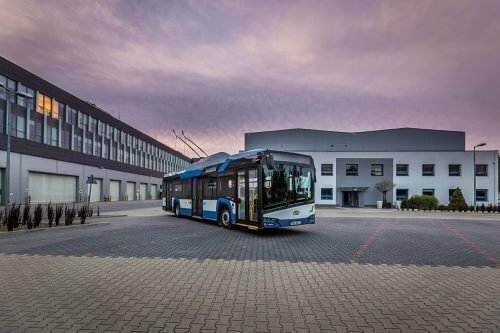 It has supplied over 500 buses, both conventional and hybrid vehicles as well as electric and gas-powered ones.